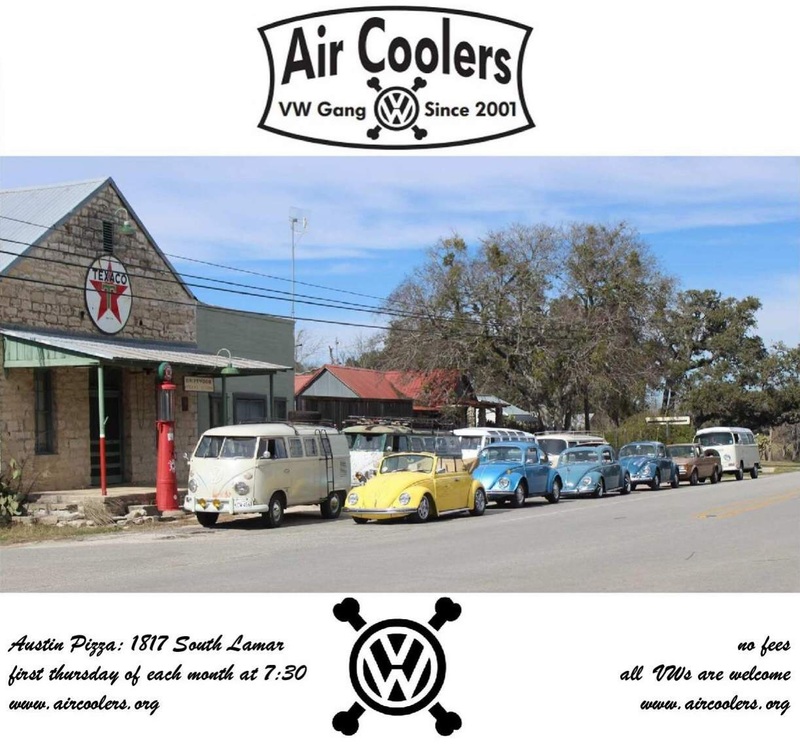 The Austin Air Coolers VW Gang meets every first thursday of the month for an informal social gathering to show off our rides (no matter what condition!) and hang out. There is NO REQUIREMENT for coming to this meeting other than to show up with an interest to be there, you don't even have to be in a VW although it is encouraged. We know as well as anyone that this can be a challenge so just do your best - your VW will appreciate it. Any VW is welcome, air cooled and water cooled, any age, any condition. Most of our vehicles are in some sort of daily driver condition so don't be bashful. (512) 795-8888. Here we get $5 off pizzas (=$8.00) and drink beers while we sit outside on the patio surrounded by VWs. Austin's Pizza is dog friendly. 8:15pm We make announcements and welcome everyone to the meeting before firing up our collective engines and embarking on our patented Tour de Force cruise to a random location (free swim at Barton Springs, shuffle board across the street, etc), or we'll just continue to grace Austin's Pizza with our presence and VWs!